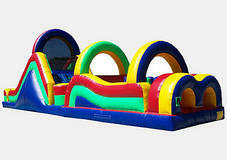 60ft Dual Lane Obstacle including inflatable tubes to climb through, under & around. Climbing wall. 18ft Double Slide landing onto a soft cushion landing at exit.